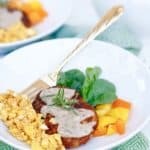 A quick, easy and versatile Country Gravy that pairs with hash browns, eggs or frankly as a delicious sauce with zoodles! To prepare gravy, place 4-quart stovetop pot over medium heat. Stir butter until melted, mixing in spices after about 1 minute. Slowly whisk in flour and begin to pour in milk, 1/4 cup at a time. Continue to stir over medium to low heat for about 5 to 7 minutes. Add in sprigs of rosemary and turn heat to low, cover and set timer for 10 minutes. Begin to prepare the hash browns by spraying a baking sheet with nonstick spray. Place hash browns and peppers on tray and cook for 6.to 8 minutes per side. While baking, don't forget to turn off the gravy. Before serving (or storing), remove rosemary sprigs. Prepare eggs by heating 3 lightly beaten eggs in a nonstick skillet. Add in turmeric and black pepper, cook until done. Remove baking sheet from oven and assemble bowls. Place two patties on the bottom, equally divided bell pepper and add some fresh spinach, if desired. Next place eggs on or next to hash browns and cover with 2 tablespoons of gravy. *I use a light plant based flaxseed butter spread. *To make fava bean flour, pulse 3 ounces of dried fava beans in a blender. If you don't have fava bean flour, whole wheat or all purpose will work fine.